Cara Sherman Tereno - ZineWiki - the history and culture of zines, independent media and the small press. Cara Sherman Tereno was born in 1953 in the state of Nevada and died in February 1996. She left her home state of Nevada to attend Wheelock College in Boston, then studied at the Kubert School of Comic Art in New Jersey, where she met and married Lloyd Tereno. 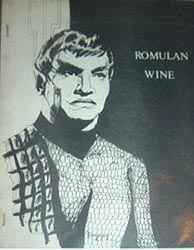 In the 1970s she published the media science fiction fanzine Romulan Wine, which was dedicated to the original television series Star Trek. Dave Puckett, comics artist, writes, "Cara published a fanzine called Romulan Wine which was basically dedicated to Star Trek, of which she (and I as well) were big fans (...) She had asked me if I was interested in writing and penciling a strip, and she'd revise and ink it, and we wanted something in the Star Trek fashion. I wrote a story about Ancient Vulcan, the main character of which was a chieftain named Mort III. Cara loved it, but was afraid that Gene Roddenberry might not approve, so she wrote him several times, and eventually, he did indeed approve of the script and even gave his blessing, making it an authorized part of Vulcan History. She published it in two-parts in her fanzine, and, to my knowledge, it was the first time anything in comic strip format referring to Ancient Vulcan was ever published. The one precedent we set in the storyline? The sun on Vulcan rose from the West." Cara Sherman-Tereno was one of the few women to work in mainstream American comics. She was employed by DC, but for herself and the non-mainstream press she produced gay vampire erotica, such as 'Life With The Vampire', drawn in 1978, published in Taboo in 1989. Cara died of leukemia in February 1996, aged 44. This page was last modified on 27 February 2014, at 14:47.